Here is the unimaginable rescue story of scuba divers off Taiwan coast. Tips for survival at sea for 48 hours are given at the end of this real life story. 8 experienced scuba divers (two females and six males) commenced scuba diving between Oluanpi and Chihsingyen, a popular diving spot off Kenting National Park. They were to return to their boat at 1130 hours on completion of scuba diving. As they failed to return, the skipper of the boat raised alarm and thereafter massive search and rescue operations were started to trace the scuba divers. What went wrong ? and Why they could not be traced ? Strong currents drifted the scuba divers and they were not aware of this. Finally they drifted more than 100 kilometres from their diving spot. Diving groups dive coach 32 year old Ting Po-ling reached Taimali after 11 hours of swimming and raised alarm to rescue the remaining divers. He swam around five kilometres against strong currents and tides. Four divers were spotted and rescued around 0135 hours at sea by the rescue helicopter. Around 0550 hours one more diver was located on the beach in exhausted state. 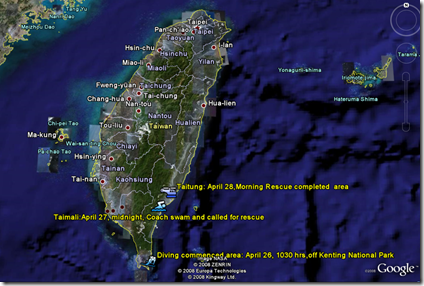 Remaining two divers were rescued near the Taitung coast around 1030 hours. All the rescued divers were taken to Mackay Memorial Hospital at Taitung for further treatment for minor dehydration,facial burns and hypothermia. Here is the map showing the locations. How the scuba divers could survive at sea for 48 hours ? Here are the tips given by them. They were floating on their backs to save their energy. The divers held each others hands and formed a ring to avoid separation. Every three minutes they were communicating with each other to ascertain their safety. They were chatting and joking to keep the survival spirit high. Used their flash lights of their underwater camera in the dark to indicate their position to the rescue helicopter. Above all diving coach Ting Po-ling took the risk of swimming more than 11 hours to shore to ask for help. He divided the divers in two groups of four. While one group stayed at sea for the rescue team to come the other group under the diving coach decided to swim to the shore. While swimming the group got separated due to exhaustion. Only the diving coach could reach the shore successfully to trigger rescue operations. What are your views ? Fact is stranger than Fiction.